Life Running Out Of Control - A German Documentary By Bertram Verhaag & Gabriele Kraber is an event that took place on 21-Jan-2007 in Hyderabad. What does genetically modified cotton do? Apart from making farmers sell their kidneys or commit suicide, that is? Here's an interesting exposé. ECOMOVE International, Germany, is screening a series of 11 documentaries from various countries, from 18th to 22nd January, at Goethe-Zentrum - The Association of German Culture. Today, the 4th day, a German documentary called Life Running Out Of Control by Bertram Verhaag and Gabriele Kraber will be screened. During the mid-'80s, science, with the help of genetic technology, made vast progress in understanding the planet and its creatures. Suddenly, everything seemed possible. Twenty years later, this films embarks on a global journey to explore the progressive and continual genetic manipulation of plants, animals and human beings. The impact hasn't always been synergistic. 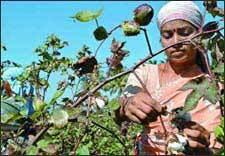 Due to a disastrous harvest of genetically modified cotton, many Indian farmers faced ruin leading them to either sell one of their kidneys or commit suicide. In the framework of an educational project initiated by ECOMOVE International, a series of film screenings and discussions take place in different cities/regions in India. For this project, ECOMOVE has prepared a film program presenting award-winning documentaries dealing with environmental problems in India and their global backgrounds and causes. An initial film screening in Chennai as well as a film tour through various villages in South India took place in April 2006. The screenings will start everyday at 6:00pm, at the Goethe-Zentrum office in Hermitage Complex, Opp. Kalanjali Showroom, Hill Fort Road, and are absolutely free. For further details, please contact 6652-6443/2324-1791. Be the first to comment on Life Running Out Of Control - A German Documentary By Bertram Verhaag & Gabriele Kraber! Just use the simple form below. fullhyd.com has 700,000+ monthly visits. Tell Hyderabad what you feel about Life Running Out Of Control - A German Documentary By Bertram Verhaag & Gabriele Kraber!